In recent years Zambia has been unable to meet growing demand for electricity, and this combined with recent poor rainfall has led to severe shortages and had a negative impact on economic development. The Mwambwa Hydropower and Solar PV Project will bring two different but complementary generation technologies to bear in support of the Government of Zambia’s policy of increasing installed capacity in the country. The Government’s aim is to eliminate the power deficit, support increased economic growth and access to electricity, and potentially provide a source of export earnings. The Mwambwa River is located close to the town of Chinsali in the north-east of the country, approximately 500 miles from Lusaka. eleQtra and its local partner are developing a hydroelectric scheme on this river, and also pursuing the development of a solar PV facility in a location nearby. 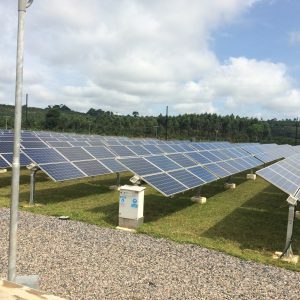 The solar facility will have the potential for up to 20MW installed capacity, as a complement to the expected 75MW installed capacity of the hydropower element of the project. As the capital of the newly-created Muchinga Province, Chinsali is earmarked by the Government as a regional hub for economic development and for power generation and transmission. The project will therefore be situated in an area with growing needs in addition to its existing unmet electricity demand, and furthermore its location places it close to the planned interconnection with Tanzania that will connect Zambia to the East Africa Power Pool (EAPP) as a complement to its existing connection with the Southern Africa Power Pool (SAPP). Establish a commercially viable hydroelectric plant and complementary solar PV facility in Muchinga Province, contributing to the development of the province through jobs, economic development, and where possible direct community development benefits to be explored during the project’s development process. Further diversify Zambia’s hydropower generation away from the main generation hydropower plants on the Zambezi River, and contribute to the Government’s overall priority of establishing new electricity generation capacity in the north of the country. Employment creation in the local community during the construction and operation period, in addition to some jobs to be created during the development period. The project will deliver reasonably priced energy to a growing region which currently has low access to electricity. eleQtra is developing the project along with a local partner, who together intend to arrange financing for construction of the project with international financing partners. The project will play a major role in establishing new power projects in northern Zambia and stimulating further investment in the sector over the coming years. Up to 20MW of solar PV generation at a nearby location. Overall project costs estimated to be c. $250m.